The Panda electronic video magnifier is a really easy-to-use magnifier for the visually impaired that offers a clear large image, full page magnification, and the right size for any house but within budget? 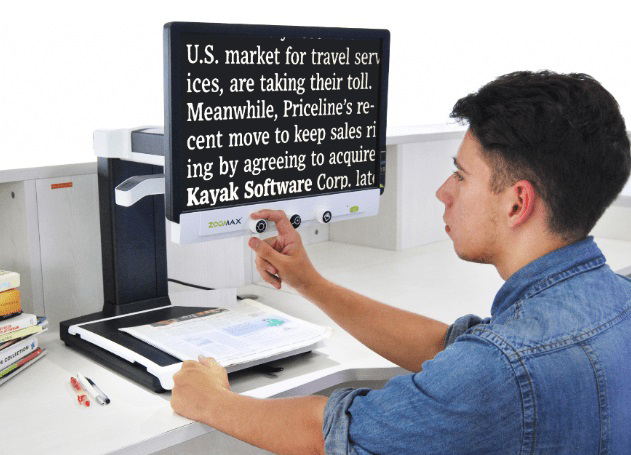 Zoomax desktop video magnifier Panda offers more than that. Zoomax Panda has high contrast black and white appearance, which is apparent for visually impaired users to reach and operate in different positions and environments. Especially designed for simplicity and convenience, Zoomax Panda has no redundant decoration and is for plug and read. On Zoomax Panda's monitor, there are only 3 big and intuitive buttons designed for 3 most frequently used functions of common desktop video magnifier: magnification change, color modes change, and brightness adjustment. So no matter who use it, grandparents or young children, it is really easy to control it from beginning. There is definitely no complex learning or training process. * Net Weight: 38.8 lbs.